I have recently purchased this vehicle and thought it would be a great little van to share out on Camptoo. It is a great little vehicle with everything you need has for either a long weekend away or trips for longer periods! Interior has all. You need fridge solar powered . Microwave stove led lights full headroom seats fold down for extra head room for tall renters interior table plus portable table and rear attached table new sound system with built in DVDs player rear camera get in touch as we can discuss discounts for longer term bookings. We don't let our van go interstate. I can even give you a push bike for the weekend for an extra fee. I wasn’t going to write a review, but I keep getting emails requesting one so here goes. The van was just adequate. A lot of little things would have made a big difference. We ran out of water because the tank had not been filled. The cap for the tank which was attached to the van with duct tape, actually fell off as we were driving. We couldn’t put the annexe up because we could only find one rope. The curtains weren’t actually big enough to cover the windows to provide privacy at night. The van was a bit disappointing overall. 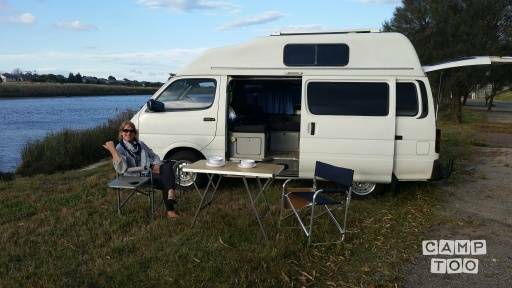 Great camper van - clean and tidy, with everything you need. Superb experience with Rick! We would recommend. We had an great experience with rick and his wonderful campavan! We had a really good time in Ricks camper! The car is fully equipped and comes with everything you need for an awesome camping trip. Everything is working fine and the car drives really good. Rick is a really friendly guy and made our holiday as easy and comfy as possible.